You, guys! 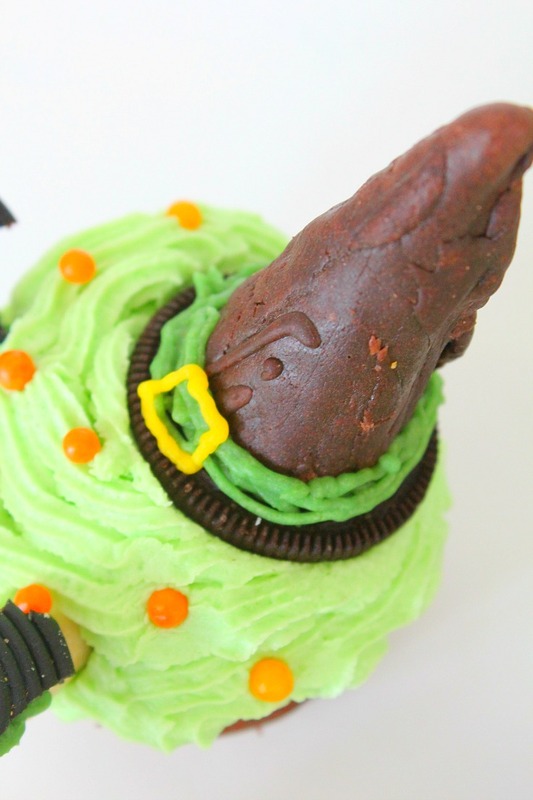 These witch Halloween cupcakes are wickedly Ah-mazing! Not only great tasting but we had sooo much fun making them! More adorable than frightening, these Halloween themed cupcakes are simple to make and are perfect Halloween treats that both kids and adults will love! 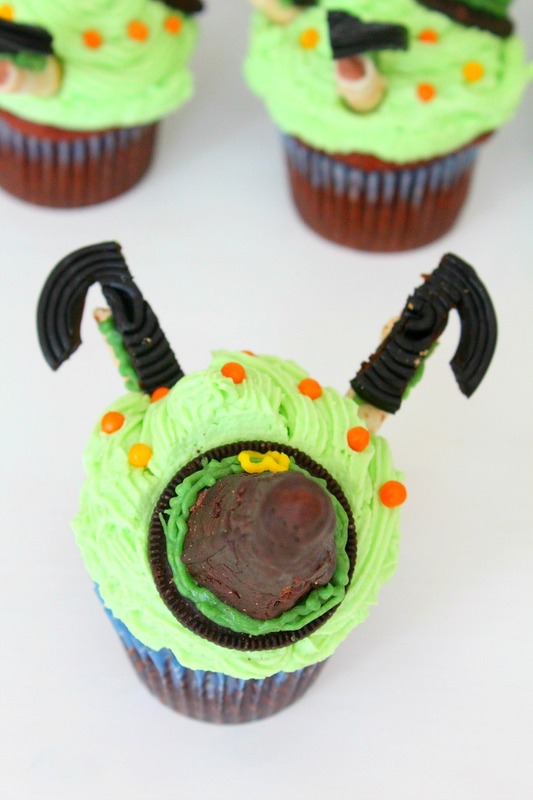 So if you’ve been looking for Halloween cupcake recipes that are easy to make but fun and exciting, look no more cause these spooky cupcakes are just what you need! 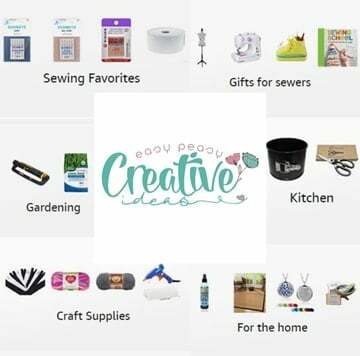 Make and bake the cupcakes according to the recipe and cool completely before decorating. If you use my recipe, you may need to cut the baking time in half; just start checking your cupcakes after 20 minutes or so by inserting a toothpick in the middle of the cupcakes. If it comes out almost clean, with just a few moist crumbs, the cupcakes are done. Prepare the hats: separate the Oreos and remove the filling with a thin knife; cut ice cones to fit the Oreos; place ice cones on a cooling rack; melt baking chocolate then immediately pour over each cone; leave to completely dry; attach the cones to the Oreo cookies using green icing; decorate with more green and yellow icing. Prepare the legs: cut boot shapes from the black gummy candies; attach to the wafer sticks using green icing. Make the frosting: Beat butter, vanilla extract and peppermint extract until smooth, approx. 3 minutes. Slowly add in powdered sugar until you reach your desired consistency. Add milk if it gets too thick, bit by bit. 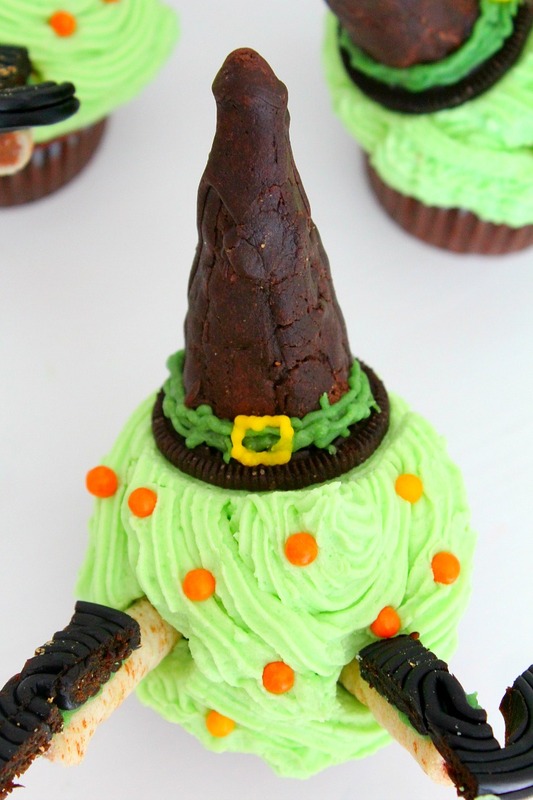 Frost cupcakes then add the legs and the hats. 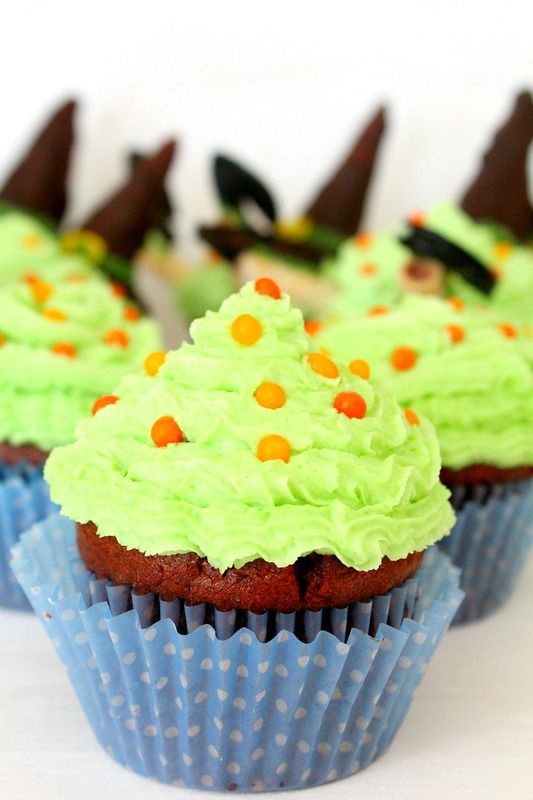 Enjoy your wicked witch Halloween cupcakes with all your ghouls and goblins! I normally lack the patience to make fancy looking desserts but strangely, these witch cupcakes got the best of me, for like 3 hours! I know, insane! But totally worth it, I promise you! 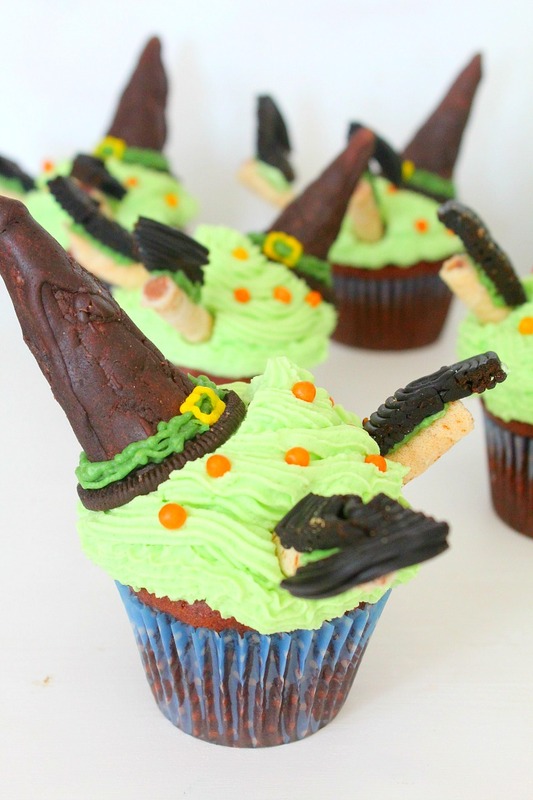 Making these wicked witch cupcakes was actual super easy peasy, just 30 minutes to make the batter and bake. But working on decorating them…that’s a different kettle of fish! 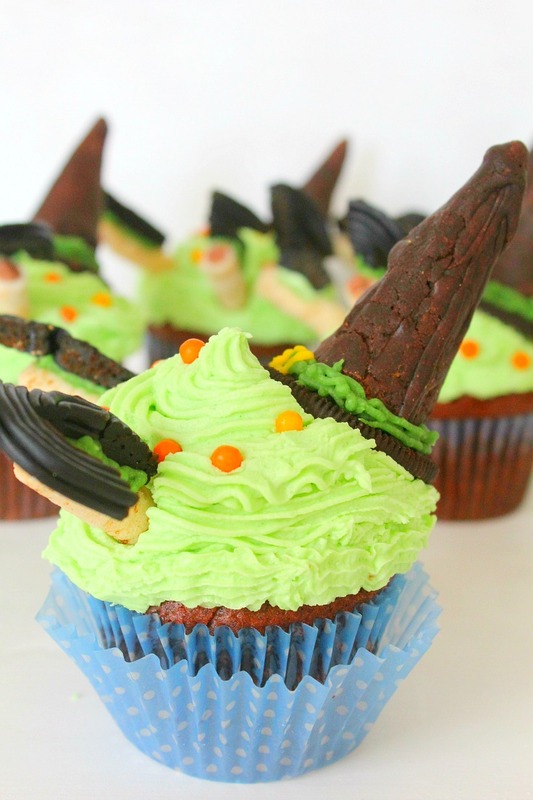 It’s definitely my clumsiness and lack of talent so if you’re more experienced at decorating cakes and cupcake these Halloween witch cupcakes will not pose any challenge to you. My daughter helped though, so add an extra half an hour if your kids will “help” too (you know, to fix a crooked leg or a hat here and there, clean up the mess they left behind, wipe tears when the darn hat just won’t stick to the cupcake and other similar “life threatening” dramas; you know the drill if you have kids). So much fun though, so much fun! 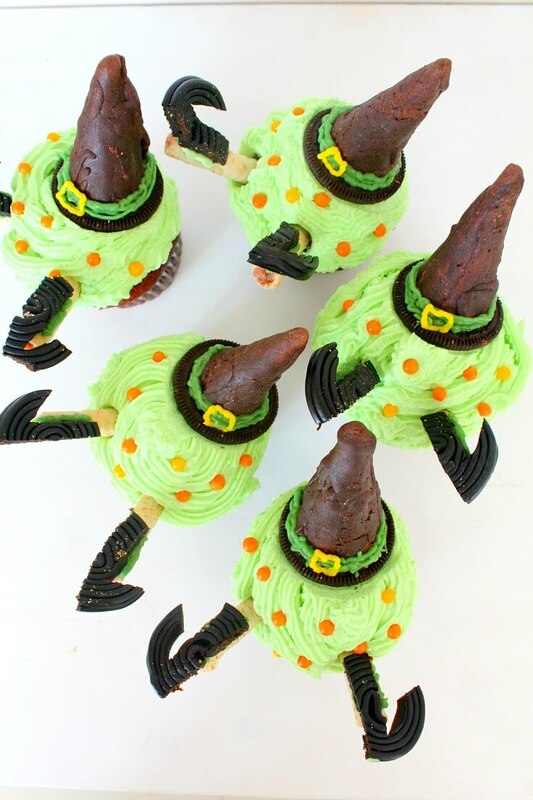 Because I wanted to make these witch cupcakes completely edible I used Oreos and ice cream cones for the hats (covered in chocolate, yum! ), wafer sticks for the legs and gummy candies (black licorice wheels) for the boots. I then “glued” everything on with green icing and made the frosting with green food coloring. I didn’t want the hats to look perfect (because let’s face it, witches are anything but perfect!) so I chose to pour chocolate over the hats instead of dipping the cones in chocolate which would give them a more polished look. But you do whatever strikes your fancy! 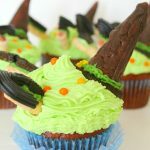 A bit of a time consuming project but these fun and delicious witch cupcakes are so worth every effort! And if you don’t have the patience or the time to decorate yours as I did, I think they look just as great covered in frosting and sprinkles only, don’t you think? 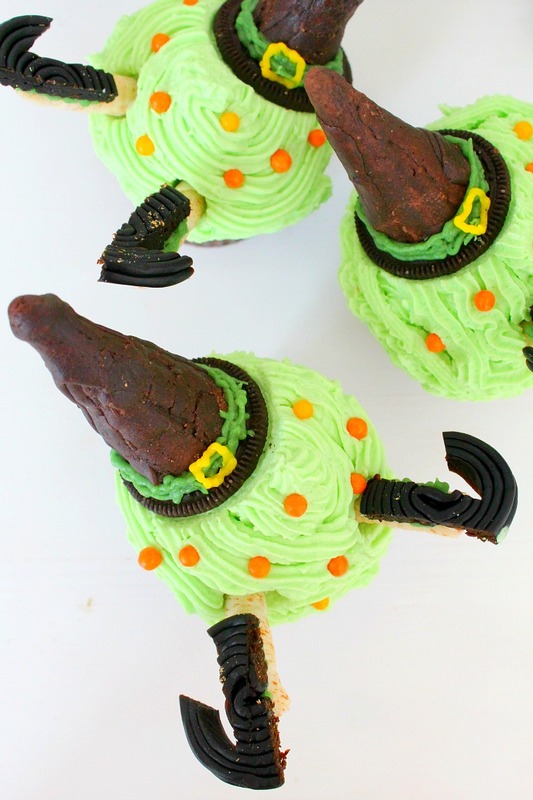 So why not put your wicked kitchen skills on the table and bake these adorable witch cupcakes this year? If you liked this recipe don’t forget to let me know below in the comments section!